Round the island, with the option of riding to and from Southampton for those who wish. An early start of 06:30 from 5 Rivers for those wishing to cycle to the ferry terminal in Southampton, or meet us for the 09:00 ferry at the Red Funnel ferry terminal. The crossing takes about 60 minutes. 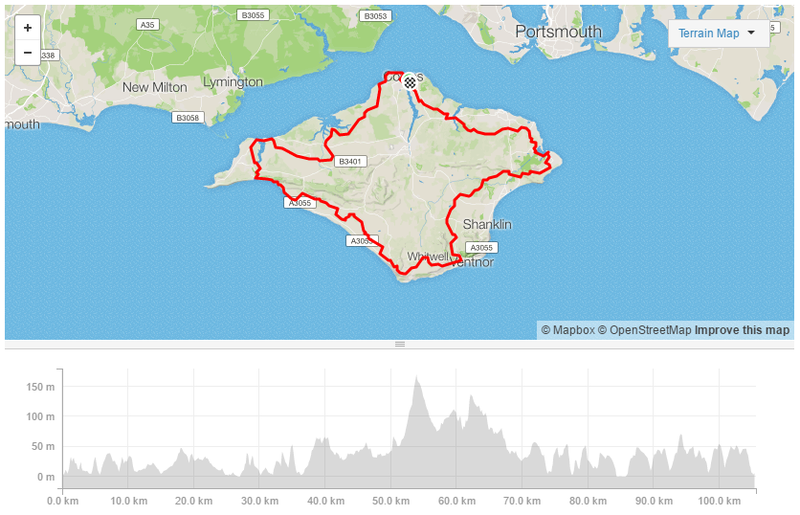 The ride profile makes for a very easy ride to Southampton! Strava link here of the route. Once we get to the island, we will go either clockwise or counter-clockwise, depending on the prevailing wind direction. The total distance round the island is 106km, following the marked route. The profile is pretty much the same, no matter which way round you ride! Lunch (most important) will be at the White Horse Inn as this is about half way round the route so works for either direction.